Recent HBR research (“Why Your Meetings Stink”, Feb 2019) reveals that leaders spend 23 hours in meetings EVERY week, but that 8 of these hours are actually unproductive. Perhaps even more disconcerting for leaders is that while they believe the meetings THEY run are “extremely or very productive”, 90% of attendees report daydreaming and 73% admit to using meeting time to do other work. 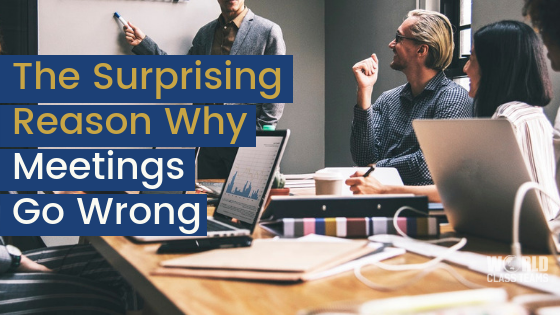 Leaders consistently rate their own meetings favourably, but they rate meetings run by others as “very productive” only 56% of the time – evidence of what they call the “I’m not the problem” attitude. Interestingly, those people who participate most in the meetings find them the most effective and satisfying. And who typically talks the most? The leader! Hence they believe the meeting has gone really well and are therefore less likely to ask attendees for feedback on it. When attendees feel frustrated or bored, they become disengaged. There is a double cost to this disengagement. Firstly, the cost of time wasted in the meeting. 23 hours in meetings per week equates to approximately 60% of your time AND your salary. Quickly calculate this in dollar terms. Are these meetings truly worth this amount? Secondly, consider the cost of not working on more important, revenue-generating tasks. One recent study found that the effects of bad meetings linger for hours, in the form of attendees complaining and being less productive when they return to their desks. DON’T GET RID OF MEETINGS, FIX THEM! Often when these consequences are pointed out, a common reaction is to ban all meetings. While most organisations have meetings that could easily be cut, meetings are great at efficiently bringing together ideas. They can elicit decisions and enable people to do their jobs to a higher standard, in a more co-ordinated, collaborative manner. Run well, meetings serve as a focal point for collective drive and energy. People feel inspired and encouraged to do their best work. In research by Steven Rogelberg, Chancellor’s Professor and the author of “The Surprising Science of Meetings: How You can Lead Your Team to Peak Performance”, two key areas usually need improvement. 1. Preparation For the Meeting: Too often regularly scheduled meetings are held more out of habit than necessity. It is easy to simply show up and default to a standard agenda. Before you hold the meeting, determine the outcomes you want to achieve. Is a decision to be made or is its purpose to gather ideas? Who needs to be at the meeting to gain these outcomes? 2. Facilitation of the Meeting: Because people often experience meetings as “interruptions from their real work”, the start of the meeting needs to include a purposeful opening statement explaining why everyone is here. Agree or remind attendees about “meeting value” (for example phones being turned off). The trick then is always to listen much more than you speak. When attendees contribute, they feel involved and are far more likely to see the meeting as effective. They will also be more committed to any decisions made. How can YOU now make sure that your team meetings are effective and well regarded by your team? Start by asking your team to rate your meetings on a 1-10 scale (1 is “a waste of my time” and 10 is “extremely useful and productive”). Ask what they find relevant and effective. Then ask them for 2 suggestions on how you could make your meetings better. Then most importantly, take action! Want to discover more tips and tricks on how to create a high-performance culture in your business? Request a FREE copy of Diana Tapp’s book “Unleash Your Team’s Potential” . CLICK HERE to get your copy.